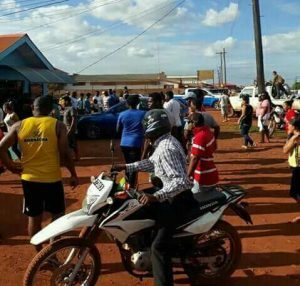 The robbery scene outside Dave’s Cell phone and Jewellery Store, Lethem. Three men believed to be Brazilians were Tuesday afternoon arrested after they allegedly robbed a shop at the southern Guyanese town of Lethem near the border with Brazil, police confirmed. Interior Divisional Commander, Superintendent Ravindradat Budram told Demerara Waves Online News that after police received a call, they immediately took up positions at strategic locations and caught the suspects. He said a firearm was used during the robbery, but none was found on any of the Portuguese-speaking men. While there is speculation that the men were escapees from a Brazilian jail, the Divisional Commander said, “they didn’t fit the description of the photographs”. Sources said the men allegedly entered Dwayne’s Cell Phone and Jewellery Shop located in the Lethem Commercial Zone, pretending to be customers. Dave’s Cell phone and Jewellery Store, Lethem. There, they allegedly held the female owner, who was the only person in the store at the time, at gunpoint. 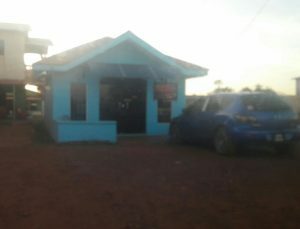 The men, according to sources, attempted to escape after the robbery with the store owner’s car but they were caught by members of the Guyana Police Force located in Lethem, one of Guyana’s newest towns.